Biography:Sion Assembly Church Ministries (S.A.C.Ministries) was established on November 23, 1993, by Ravi Lokesh Kumar and his brother Y.Rajendra Kumar. When their mother, nearly on her death bed was supernaturally healed from cancer, they felt led to dedicate their lives to full-time ministry. Ravi, his wife Prathibha, and his family members are devoted servants of their calling and labor together to further their Church Vision. From its humble beginnings, God has faithfully blessed and prospered S.A.C. Ministries. They now have planted six churches, are working in 40 different places and have a congregation of nearly 500 people. 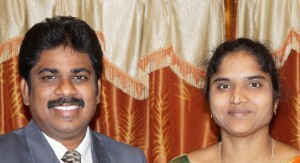 The Holy Spirit has led them to take the Gospel into rural, tribal, and unreached areas of Andhra Pradesh. Ravi came to know Jesus as a Hindu. His heart goes out to those still in his former religion, and his great passion is to connect souls from the Hindu religion with the Gospel of redemption through faith in Jesus. Sion Assembly Church Ministries conducts seminars and prayer conventions to equip those working in the community with the true Gospel message while filling them with the Holy Spirit. They have small children/youth camps and Sunday school meetings, jail visits and prison meetings, and preach healing to HIV patients to connect them with the Lord Jesus. Ravi has a heart for reaching the lost, teaching and spreading the Gospel, taking care of the families and people in his community, and church planting.